HDR TV: What is it? How can you get it? | What Hi-Fi? Every few years, manufacturers come up with a range of new, cutting-edge technologies, most of which have acronyms guaranteed to give your keyboard's caps lock key quite some workout. UHD and 4K. HDCP. OLED. And the latest one, HDR, is arguably the most important, and the most confusing, buzzword in the TV world right now. You’ve probably heard of HDR and its many variants by now, but it’s a complicated subject, especially with manufacturers and content creators developing and implementing different varieties of HDR – which can be difficult to keep track of. ‘HDR’ stands for High Dynamic Range, and it is the current big thing for 4K TVs and 4K content. The term originates in photography, and refers to a technique to heighten a picture’s dynamic range – the contrast between the brightest whites and the darkest blacks. The theory is: the higher the dynamic range, the closer a photograph gets to real life. HDR for televisions is basically the same idea. Look at the sky. The clouds may be white (or grey in the UK), but there should be definite layers. Around the clouds, you should be able to pick out varying degrees of brightness. Now look at clouds on your TV. They tend to look flat by comparison, with white levels crushed and layers virtually indistinguishable. There are several reasons for this. What's so good about HDR? The first reason is your TV’s limited dynamic range, or its inability to illustrate the finest differences in brightness. This means you miss out on the nuance that should be there. After all, your eyes can differentiate a lot more information than your TV feeds you. Then there’s the processing that takes place along the chain after something is filmed. It dramatically reduces the amount of information transferred in order to match the technical limits imposed by your TV. Lately, though, TVs have become much more capable. And by that, we mean bright. A normal TV puts out around 100-300 nits of brightness, where one nit (from the Latin for ‘to shine’) is equivalent to the light provided by one candle. An HDR TV can, in theory, deliver up to 5000 nits. Currently, there are five different varieties of HDR: HDR10, HDR10+, HLG, Dolby Vision and Advanced HDR by Technicolor. HDR10 is the original and currently most common form of HDR. It's an open standard that has been adopted by numerous manufacturers, service providers (Amazon and Netflix) and the Blu-ray Disc Association (BDA). According to the Consumer Electronics Association (CEA), HDR10 must meet certain standards, including 4:2:0 colour sub-sampling, 10-bit depth and the BT.2020 colour space. It applies those specific standards to the picture displayed by the TV. As a general rule, all 4K TVs currently on the market and going forward should feature HDR10. This means your TV will be compatible with the most widely available 4K Blu-ray discs, 4K players and 4K streaming content – and it should offer a far better picture than a 4K TV without any HDR. However, the electronics industry hasn't yet settled on a single standard. Dolby Vision HDR was initially planned for the company's Dolby Cinemas, combining HDR video with Dolby Atmos sound in an attempt to take on IMAX cinemas – but Dolby Vision can also be adapted for the home. The key difference between Dolby Vision and HDR10 is that the former allows for dynamic metadata to be added and adapted to an HDR image on a frame-by-frame basis. In theory, this should potentially allow for a subtler, more improved image. HDR10, meanwhile, applies its parameters scene-by-scene – for instance, every time a camera angle changes. While Dolby Vision's adaptive skill should deliver a superior picture to HDR10, we’ve found the quality depends on how well the film (or disc) implements the tech. Both HDR10 and Dolby Vision can feature on the same TVs and discs, although Dolby Vision isn't yet as ubiquitous. Despicable Me and its sequel marked the first Ultra HD Blu-rays with Dolby Vision, while other recent releases include mother!, IT, Spider-Man: Homecoming, Star Wars: The Last Jedi, The Matrix and more. The two formats can happily coexist (Amazon Prime Video and Netflix offer both), although you will need a Dolby Vision-compatible disc, Blu-ray player and TV capable of processing it before you can enjoy the technology at home. The list of compatible TVs and Blu-ray players isn’t as long as HDR10's, although newer 4K Blu-ray players are increasingly adopting the format as part of their specs. Part of the issue is that (unlike HDR10) Dolby Vision requires a payment of a licence fee. LG was one of the first to adopt Dolby Vision, and it features across the company's flagship TV range, including its rollable OLED and 2019 C9 flagship TV. Panasonic is also on board - the new GZ2000 flagship features Dolby Vision (and Atmos. Select 2018 OLED and LCD TVs from Sony also supported Dolby Vision, so we'd expect the company's 2019 TVs to follow suit. Samsung has decided to confuse things even more by developing its own standard of HDR: HDR10+. Just like Dolby Vision HDR, Samsung's tech uses dynamic metadata to boost HDR images frame-by-frame. The HDR format’s metadata will be licensed to manufacturers of TVs, digital TV boxes and Blu-ray disc players, as well as content companies. It will be an open, royalty-free platform (although most brands will have to pay an annual administration fee) and, naturally, will be associated with its own certification and logos. 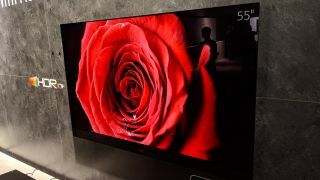 The 2019 Samsung flagship does again have HDR10+, several of Samsung's 2018 4K TVs are also HDR10+ compatible, but it's 2017 models are still awaiting a firmware update. Since HDR10+ is aimed as a direct rival to Dolby, none of Samsung's TVs support Dolby Vision. In a bid to bring the format to more hardware, Samsung announced a partnership with Panasonic, 20th Century Fox and Warner Bros. to start licensing the HDR10+ platform. The 'majority' of Panasonic's 2018 4K models recently received a firmware update to enable HDR10+ support, while Philips has also joined the HDR10+ bandwagon, preferring it over Dolby Vision for its 2018 models. The first Ultra HD Blu-ray discs with HDR10+ are now on the market, while Amazon Prime Video also supports HDR10+, albeit only on select TVs and streaming products. Hybrid Log Gamma (HLG) is potentially the most important HDR format of all, because it is used with TV broadcasts. The result of a joint research project between the BBC and Japanese broadcaster NHK, HLG is designed to deliver a more convenient HDR solution for the broadcast world. It takes standard dynamic range and high dynamic range images and combines them into one feed, with HLG-compatible 4K TVs able to decode and show HDR images in all their glory. And we've had plenty to sample in the last year or so, including the World Cup and the Wimbledon Championships in the summer of 2018. The BBC's most recent wildlife documentary, Dynasties was also made available to stream on-demand on iPlayer in 4K HLG. A list of 4K iPlayer compatible TVs can be found here. Launched back at CES 2017, Advanced HDR by Technicolor is the least well-known of the HDR formats. It's the result of collaboration between LG and video specialists Technicolor, but LG is the only manufacturer to support the format so far. As with other types of HDR, the content needs to be mastered in the format, played back by a source that can read the Advanced HDR data and then displayed by a compatible television or projector. However, there's still no official word on any upcoming content that's been mastered in Advanced HDR by Technicolor. Despite this, a number of LG's 2017 TVs (both 4K OLED and LCD) and its 2018 TVs are compatible with the format. HDR should not be confused with the other big TV buzzword of the era: UHD (Ultra High Definition), also known as 4K. Both HDR and UHD are meant to improve your viewing experience, but they are hugely different technologies with almost no overlap. It’s a matter of quantity and quality. UHD is all about bumping up the pixel count, while HDR wants to make the existing pixels more accurate. Whether you’ve got a 32in unit in the bedroom or a 75in monster in the living room, HDR makes a visible difference. Of course, 4K and HDR tend to come hand-in-hand. The vast majority of HDR-compatible TVs on the market are also 4K Ultra HD TVs. To benefit from HDR10 or Dolby Vision, you’re going to need a display. Whether it's a television, a projector, a mobile phone or tablet, it needs to be HDR-compatible. All the big-name brands now support HDR video, so if you’re looking to buy a new 4K TV right now, especially one of the higher-tier TVs, it should support the format as standard spec. Don't confuse normal HDR with picture processing modes such as HDR+ or HDR Effect. These are modes (used by Samsung and LG respectively) that claim to create HDR-quality images from non-HDR content. Next, you will need something to play HDR content on. If your HDR content happens to be on a disc, eg. an Ultra HD Blu-ray, you need an Ultra HD Blu-ray player. Our current favourites are the Sony UBP-X700 and Panasonic DP-UB9000, but Microsoft's Xbox One S and Xbox One X also play 4K Blu-rays and include HDR10 support. Sony's PlayStation Slim and PlayStation 4 Pro aren't 4K players, but they are compatible with HDR10 content, including games. Alternatively, you can stream HDR content via Netflix or Amazon Prime Video – both services support HDR10 and Dolby Vision. This can be done through a compatible app on your TV or streaming box, such as the latest Amazon Fire TV Stick 4K or the Apple TV 4K – the latter will also offer 4K HDR films (in HDR10 and Dolby Vision) through Apple's iTunes service. For that, you’ll need an internet connection with the appropriate bandwidth. The Xbox One S not only has an Ultra HD Blu-ray player, it also supports HDR video. You'll need a TV that supports HDR10 to view HDR content from the Xbox One S.
The Xbox One X also features a 4K Blu-ray player and has native support for 4K HDR gaming at 60fps (frames per second). If HDR is supported on your TV (and turned on), then both consoles can output HDR video from any compatible source – Ultra HD Blu-ray discs, HDR streaming services and HDR games. The number of HDR-compatible Xbox games continues to grow, with titles including Call of Duty: Black Ops 4, EA Sports FIFA 19 and Red Dead Redemption 2. While the PS4 Pro launched without a 4K Blu-ray drive, it does support games that have been optimised for HDR, such as Assassin's Creed Origins and Spider-Man. The ill-fated Samsung Galaxy Note 7 was the first HDR smartphone. Since then, we've seen flagship smartphones from LG, Samsung, Sony and Apple launch with HDR support. There's more mobile-optimised HDR content, too, with both Netflix and Amazon Prime Video now streaming HDR content via their mobile apps. Netflix's HDR offering is now compatible with the smartphones listed above, and YouTube has also updated its app to bring HDR to select Android phones, including the Samsung Galaxy Note 9 and Google Pixel 3 XL. Called Mobile HDR Premium, the standard is essentially a certification for smartphones, tablets and laptops that meet minimum standards in terms of resolution, dynamic range, colour space and bit depth. With this label, you're guaranteed a certain level of experience when watching 4K HDR content. It will also apply to 4K HDR content optimised for mobile devices. The Samsung Galaxy S8 and Galaxy S8+ were the first smartphones to officially be given Mobile HDR Premium certification, while the Galaxy S9 and S9+ phones also followed suit. Meanwhile, the LGs and recent Apple iPhones, including the XS and XS Max have additional support for Dolby Vision HDR content. HDR content is filmed or mastered in HDR – playing ordinary footage on an HDR TV alone won’t cut it. Amazon Prime Video was the first service to stream ‘HDR’ footage with shows such as Bosch and Transparent, but Netflix also has an increasingly large share of HDR content including GLOW, Stranger Things (series two), The OA, Bright, Marvel's Daredevil and Jessica Jones. These shows are usually also in 4K, but that’s not always the case. For example, American Gods is available in 4K, not HDR, whereas Star Trek: Discovery is available to stream in HDR – but not 4K. Your TV should state if HDR is being displayed or not. The launch of the Apple TV 4K, brought with it 4K HDR films through iTunes, including Dolby Vision on some titles and for no extra cost. At the time of writing the 4K films on the service are stream-only, so users can't download them. There’s also the Ultra HD Blu-ray format, which includes HDR10 in its base specification (pretty much a given now with new 4K releases) and also supports Dolby Vision on select titles with HDR10+ releases set to follow. In a short space of time, HDR has become a reality for more consumers, and it's something that should be considered when upgrading your current TV. We’ve seen it in action and, on the whole, the results have been impressive. The combination of 4K and HDR on a TV means a super-sharp, super-dynamic picture – and a clear step-up from Full HD. For enthusiasts, this could be the complete AV package. The only potential issues are the different variations of HDR and the need to ensure your TV is future-proofed for when the different versions go mainstream. At the moment, we'd ensure yours has HDR10 and Hybrid Log Gamma as the bare minimum, though support for Dolby Vision is certainly gathering pace. Despite this, the quest for ultimate picture performance looks to be in in a very good place indeed. Consumers now have access to the displays, the sources and the content to complete the HDR chain. So now's the time to embrace it.